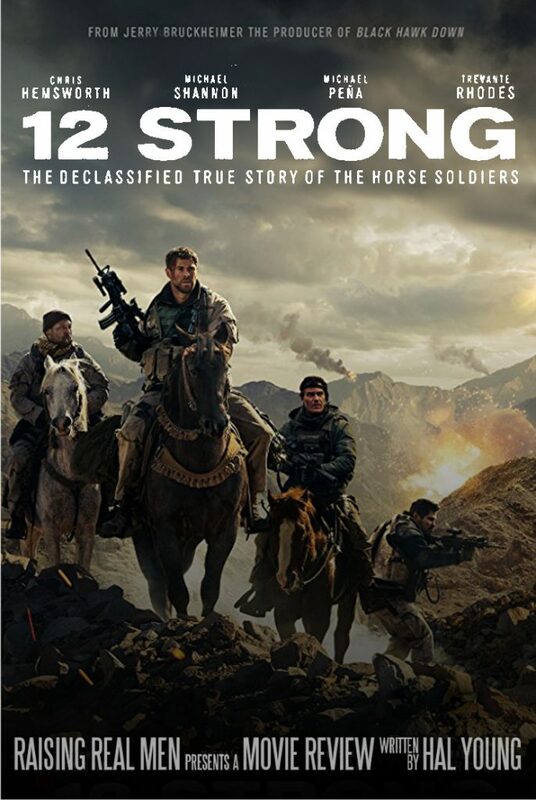 12 Strong is the story of the Army Special Forces team which dropped into northern Afghanistan 39 days after 9/11, our first military response to bin Ladin’s terrorist network. Their mission was to link up with an Afghan commander named General Dostum, earn his respect, and fight alongside his men as their link to American air power. The goal is to capture a Taliban stronghold called Mazar-i-Sharif. 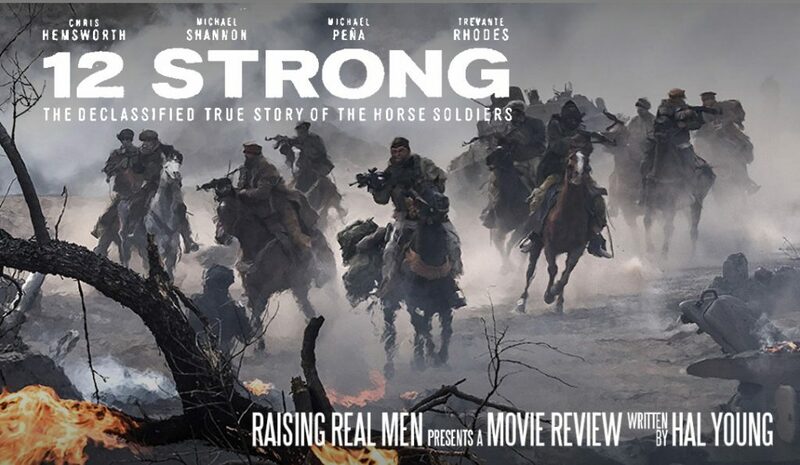 But they are in a race against the Afghan winter (which even the Russians considered brutal), dealing with incredibly rugged terrain that can only be crossed on horseback, engaging in a guerilla war where the friends and enemies are indistinguishable – and in fact, sometimes change sides without warning. And although team members have seen combat experience in Somalia and Operation Desert Storm, their young captain hasn’t been under fire yet. That’s the major focus of the film – the three-week baptism of fire for Captain Mitch Nelson (played by Chris Hemsworth). The title speaks of twelve men, but the story follows Nelson almost exclusively – the viewer doesn’t meet most of the team. Nelson has to prove himself – every officer knows he has to inspire confidence, but eventually it’s got to be tested. Nelson’s won the confidence of his team and (somewhat) convinced his commander, but he has to win the trust of the Afghan general and prove his “swagger” is more than talk. And he has to fulfill a promise to his wife – to make it back. This is a very intense film – the scenery itself is eye-popping, and the frequent combat sequences are jarring and bloody. 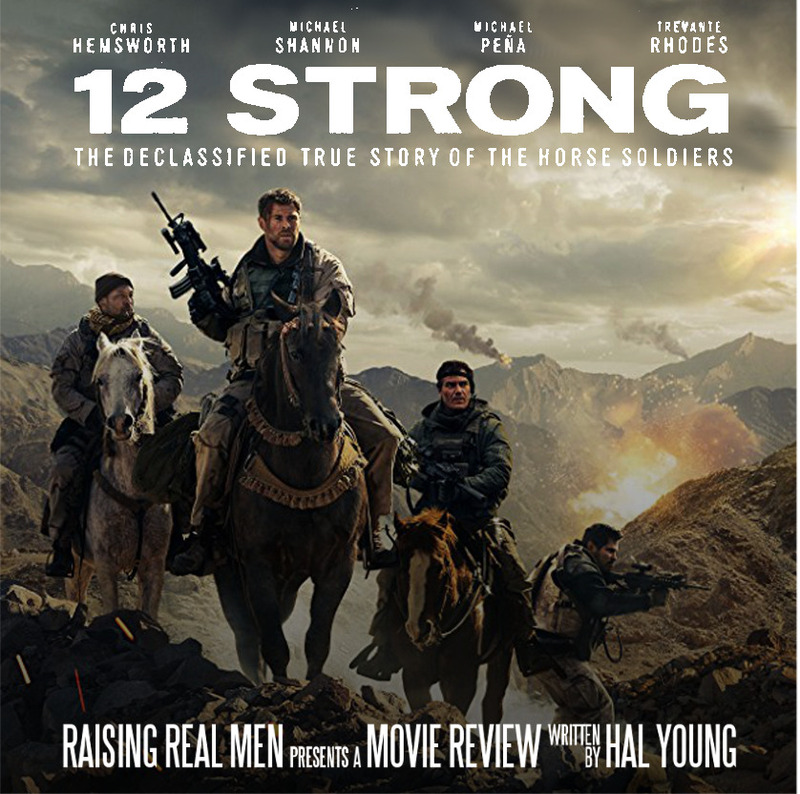 The R-rating is well deserved; we see raw brutality at the hands of the Taliban, there is multiple head shots with flying blood and splattered brains, and dismembered body parts on the battlefield. And there’s profanity – lots of it. Lots and lots and lots. As a former military officer myself (who went on to become a factory supervisor and construction engineer), I’ve heard enough to say this is realistic – in some circles, it’s so much a part of the vocabulary you can become numb to it. It may be problematic for some viewers. And there one image you’re unlikely to ever see anywhere else – Green Berets on horseback, attacking a Soviet rocket launcher with automatic weapons. It actually happened. Trust – Throughout the film, the challenge is to create and maintain trust – by proving trustworthy. Although Nelson has never been in combat, his team of veterans has learned to trust his leadership during the intense ongoing training of Special Forces; once he’s in the field, he has to live up to that expectation. When he is about to deploy, his wife says, “I don’t care how long you’re gone, so long as you tell me you’re coming home.” “It’s bad luck to say that before a mission,” he says. “But I need to hear you say it,” she says, and so he does. When his warrant officer suggests he leave a farewell letter like the rest of the team members, “in case something happens,” Nelson growls, “I promised my wife I’m coming home. I’m not writing her a letter that I broke my promise.” The team’s first mission is to earn the trust of General Dostum – which they do on the battlefield. And when they return to base, the commander meets Nelson at the helipad with the laconic comment, “You kept your promise” – not knowing he’d kept several. Chaos – Combat is not neat, but the situation in Afghanistan is particularly nasty. Several characters reference the old nickname, “Graveyard of Empires,” and there are reminders of Russia’s failure to control this wild land – including abandoned Soviet weaponry in use by the Taliban forces. Nelson observes that Dostrum is not fighting one war but several – the Taliban first but rival warlords a close second. When Dostrum extends an informal truce to a rival, Nelson says, “You made the right choice,” and Dostrum replies, “Here, there are no right choices.” He warns the young captain, “The Americans will become just another tribe. We will be friends today, and tomorrow we will be enemies.” There is a fatalism in the history of this barren country. But the general concludes, “but you … will always be my brother.” So that mission, at least, is clearly accomplished. The film (based on a true story with a few changes) is exciting, no question. In the middle of the confusion, there are definite lines of right and wrong. Certainly it shows that militant Islam is a threat to fellow Muslims first, before it reaches out to the infidel West. There are some good themes and messages, though some are more cautionary than encouraging – what are our chances of a lasting “win” in a country so resistant to change? – and the messages can be easily overwhelmed by the drama of combat. At least, in this case the good guys actually do win – both on screen and in real life. Looking for more heroism your whole family can enjoy? Check out our audiobook series, Hero Tales from American History!